If you're researching engagement rings for the first time, we understand it can get quite overwhelming. There are so many different designs, metals and gemstones used in engagement rings and you also have to find the one that best describes your personal style. That's why we think it's essential that you know your basics before you go shopping for your ring. Let's start with these 30 terms. Solitaire Engagement Ring: The solitaire ring is the most popular design of engagement rings. There is only one diamond on the band hence the name solitaire. Halo Engagement Ring: The center diamond is fully surrounded by a 'halo' of accent diamonds. The halo and the center diamond give the appearance of one big stone so the diamond appears to be bigger than it is. Double Halo Engagement Ring: The center diamond is surrounded by two concentric halos of accent diamonds. Three Stone Engagement Ring: As the name suggests, there are three diamonds in this ring. On either side of the center diamond, there is one diamond. These two side diamonds are usually half the carat weight of the center diamond. Side Diamonds Engagement Ring: In this design, there are smaller diamonds on both sides of the center diamond. These diamonds are called accent diamonds and they add extra sparkle to a ring. Prong Setting: The tips that secure the diamond to the band are called prongs. Prongs are one the most popular and common type of setting used to secure gemstones and diamonds to the rest of the jewelry. Six Prong Engagement Ring: Most rings and other jewelry have four prongs but six prongs are also popular. Bezel Setting: In this setting, a thin metal border fully surrounds the diamond, making it a very secure setting. The bezel fully protects the girdle of the stone, offering extra security against chipping. Basket Setting: In the basket setting, there are one or two rings connecting the prongs for extra security. The overall shape looks like a basket, hence the name. Tension Setting: In a tension setting, the diamond is held together by compression. The two ends of the ring's band add pressure from both sides, keeping the diamond in place. There are also grooves on both sides, where the girdle of the diamond fits in. Cathedral Setting: The cathedral setting is more about the profile of the ring. The ring band raises towards the center stone, giving it the appearance of graceful cathedral ceilings. A cathedral setting can have either prongs, a basket or bezel. The advantage of this setting is that it holds the diamond high above the band of the ring, making the diamond appear quite large. Accent Diamonds: The small diamonds, other than the center diamond are called accent diamonds. They can be present on the shank or gallery of the band or any other spots. Their purpose is to add extra sparkle to the ring. Pave Setting: In pave setting, the diamonds are set together very closely by tiny beads of metal. These beads can be a part of the band or they can be soldered on. They blend so well with the metal band, that when the diamonds are set, they almost fade away into the background. Micro Pave Setting: Micro pave uses the same technique but for smaller diamonds hence it is even more smaller than pave setting. Channel Setting: In this setting, the accent diamonds are set in a continuous row between the two metal walls of the band of the ring. There is a slight indentation or channel between these two walls, where the girdle of the stone is secured. There is no metal between the diamonds so they sparkle brilliantly. Bar Setting: In this setting, a diamond is set in place with a bar of metal on either side. It is a very secure setting and a good choice for people with active lifestyles. 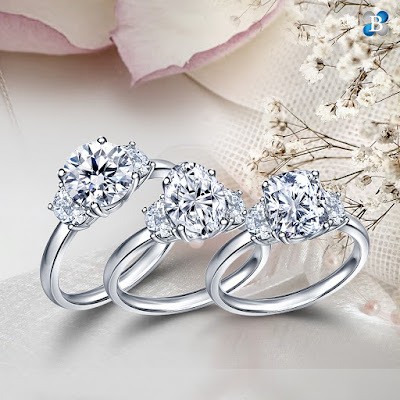 Shared Prong Setting: In shared prong setting, each accent diamond shares one set of prongs with the diamond set next to it. Flush Setting: A hole is drilled in to the band and the diamond is set in it. The top of the diamond sits flush with the band of the ring. The metal is hammered in place so the diamond stays secure. Ring Gallery: The gallery is that part of the ring that connect the center stone setting and the shank of the ring. Ring Shank: The band of the ring, around your finger is called the shank. Split Shank Engagement Ring: The shank splits into two narrow bands as it approaches the center diamond. Jewelers often recommend the split shank setting for elongated center diamonds like the oval, pear and marquise as it helps to visually balance these diamonds. Tapered Shank Engagement Ring: The shank gradually becomes narrow on either side of the center diamond. This highlights the center diamond beautifully and may even make it appear bigger than it is. Yellow gold Engagement Ring: Naturally occurring gold has a yellowish tint and hence the name. Yellow gold jewelry is made alloy that contain pure gold along with metals such as copper and zinc as pure gold is too soft to make durable jewelry. White Gold Engagement Ring: An alloy of gold that contains gold along with white metals such as nickel, silver and palladium. White gold jewelry usually has a rhodium coating. Rhodium is another white metal. Rose Gold Engagement Ring: An alloy of gold that contains a more percentage of copper that results in the pinkish hue of metal. Platinum Engagement Ring: Platinum is a naturally white and dense precious metal. When used for making jewelry, the alloy is about 95% to 98% pure while the rest are other metals. 14K Gold Engagement Ring: An alloy of gold that contains about 58.3% gold while the rest are other metals like silver, copper and zinc. 18K Gold Engagement Ring: An alloy of gold that contains about 75% gold while the rest are other metals like silver, copper and zinc. Fancy Color Engagement Ring: Diamonds in colors such as yellow, pink, brown or shades other than the colorless or white diamonds are known as fancy color diamonds. Fancy Shape Engagement Ring: Diamonds in shapes other than the round are known as fancy shape diamonds.